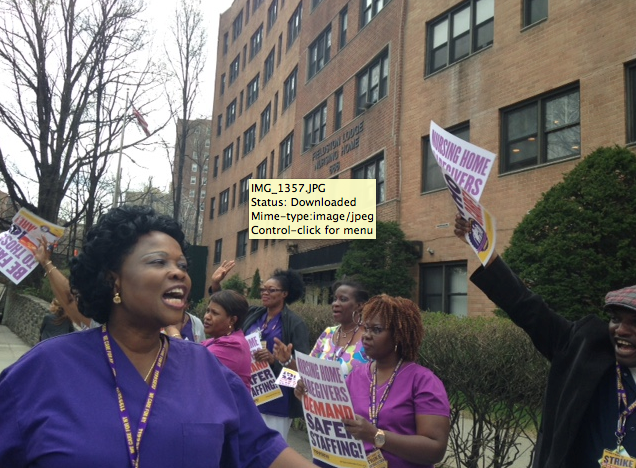 Nursing home workers picketed today outside of nearly 160 for-profit nursing homes across New York City, Long Island, Westchester, Rockland and Orange counties to demand improved staffing for consistent quality care of nursing home residents. 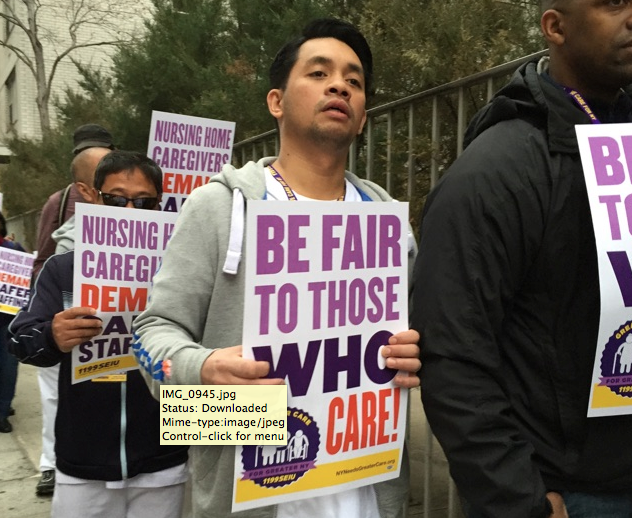 New York, NY – Nursing home workers, members of 1199SEIU United Healthcare Workers East, took to the streets in the midst of contract negotiations with the Greater New York Health Care Facilities Association to demand safer staffing in area nursing homes. They have been working without a contract since it expired on Sept 30, 2014. 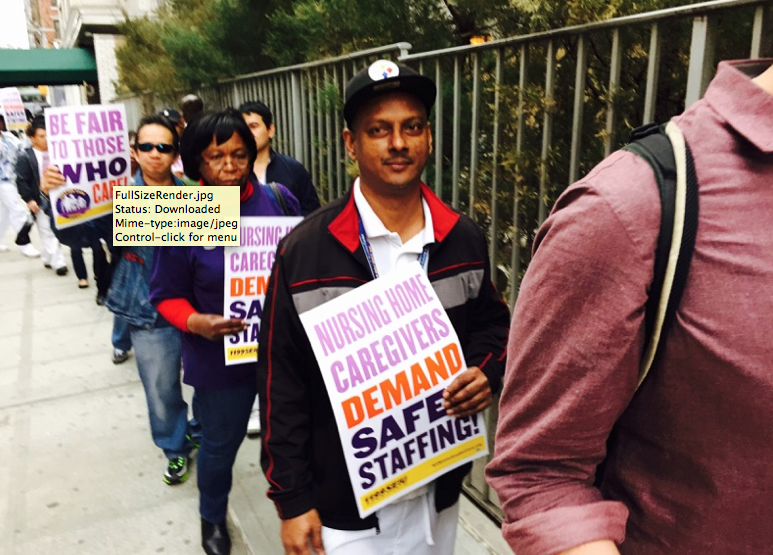 The caregivers’ primary concern is staffing and how it impacts the continuity of care for their residents as the homes increasingly rely on temporary agency staffers to supplement the chronic understaffing of full-time workers. Nursing home workers are tasked with providing the best quality care, assisting residents with bathing, eating, mobility, and administering medication. 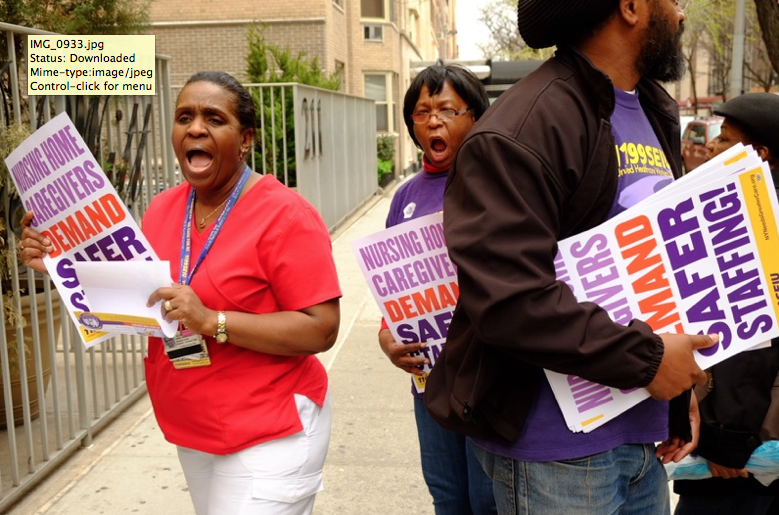 Adequate staffing levels allow caregivers to center care on the resident, know their needs, and observe when residents are behaving unusually–possibly signifying a medical or other problem. 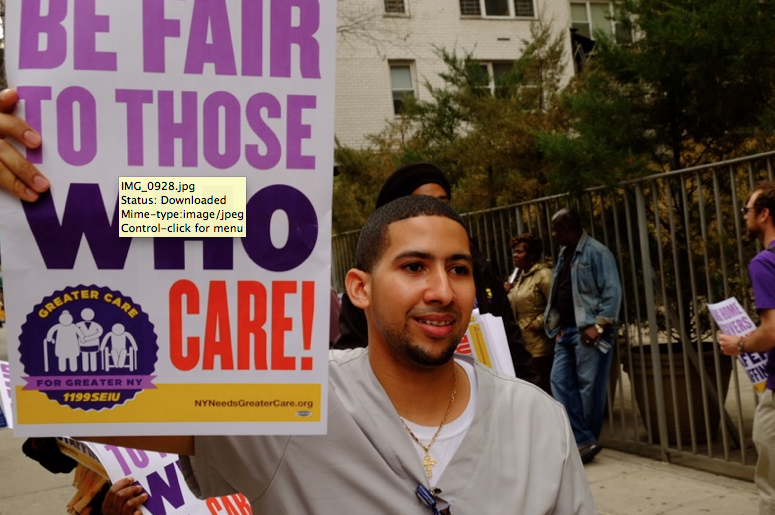 Inadequate staffing levels force direct care workers to split their time between more residents, reducing the time each resident receives, and ultimately undermining person-centered care. “I’ve gone to floors and seen three completely new C.N.A.s. with no long-time staff who know the residents on the floor. It takes time to build relationships with your residents and learn a care plan. How can they provide quality care? They are walking around just trying to figure out what to do. They can spend half the day just catching up on paper work,” said Luis Arroyo, a housekeeper from Kings Harbor Care Center. 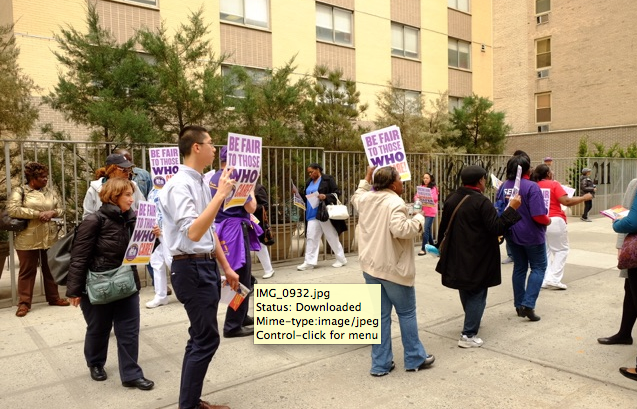 Demographers note that soon older adults in New York City will outnumber school-aged children, a phenomenon they refer to as the “graying of the city.” The aging of New York City and State highlight the urgent need to address the working conditions of long-term care workers like those in nursing homes. 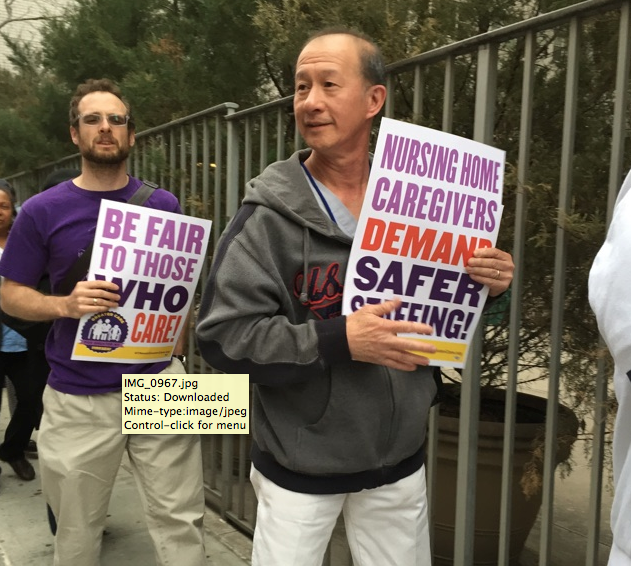 The nursing home workers say owners have a responsibility to ensure a stable workforce of caregivers to provide compassionate care to senior citizens. 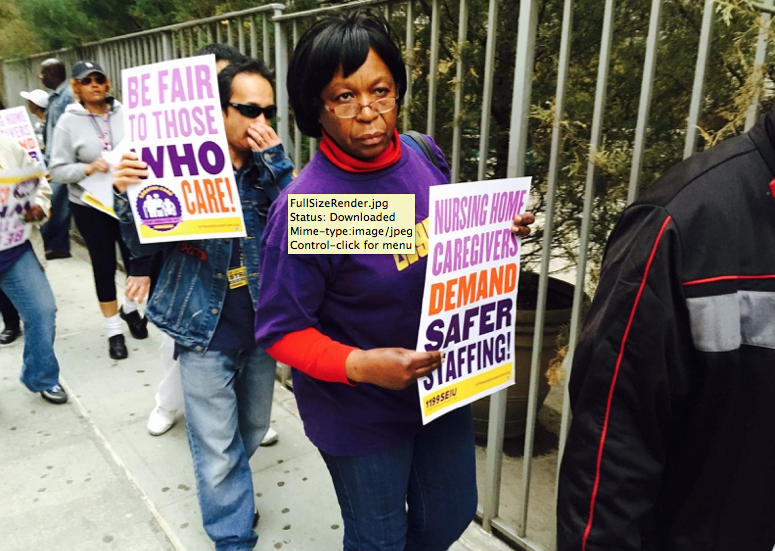 “It seems like management forgets that these nursing homes are actually people’s homes. It’s our job to try to make people as comfortable as we can. 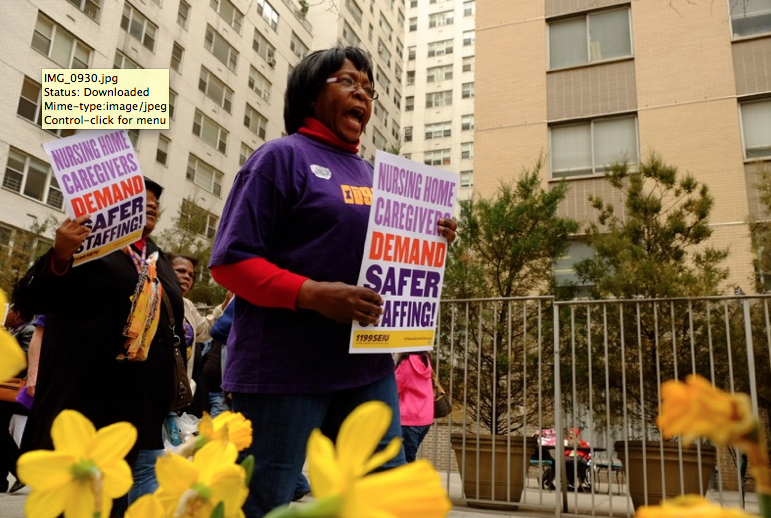 We need safe, adequate staffing in every department of the nursing home, said Annie Bryant, who has been a certified nurse assistant for nearly 50 years at Regency Extended Care Center. 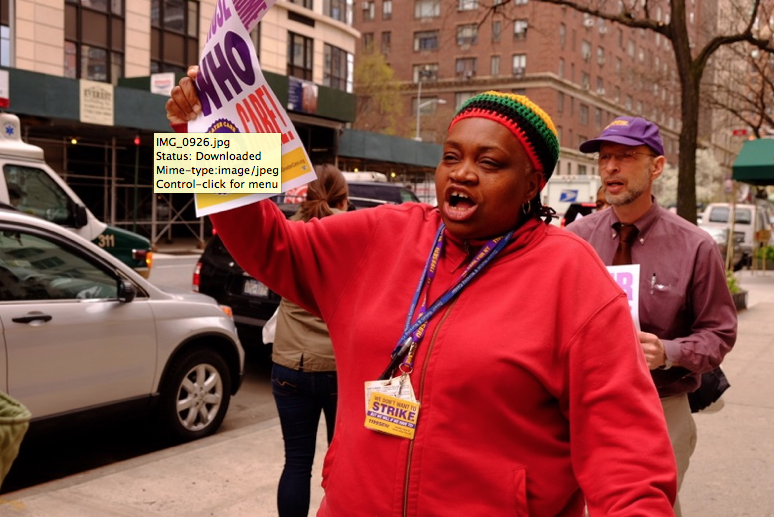 With over 400,000 members in New York, New Jersey, Massachusetts, Maryland, Florida and Washington D.C., 1199SEIU United Healthcare Workers East is the largest and fastest growing healthcare union in the country. 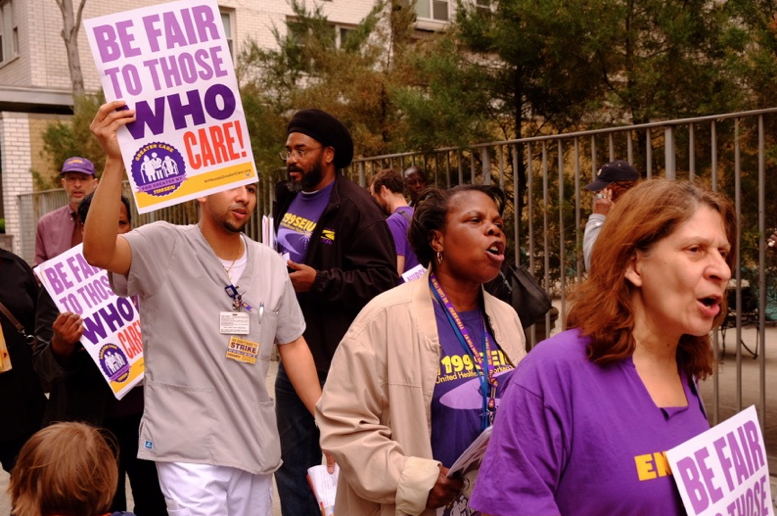 Our mission is to achieve quality healthcare and good jobs for all.